Dubai-based global marine terminal operator DP World has revealed strong financial results for the 12 months ending December 31, 2017, which saw the company deliver earnings in excess of $1.2 billion. On a reported basis, revenue grew 13.2 per cent to $4.715 billion and adjusted EBITDA increased 9.1 per cent to $2.469 billion with adjusted EBITDA margin of 52.4 per cent. Profit attributable to owners of the company, before separately disclosed items, was $1.209 billion, up 7.3 per cent, and EPS was 145.6 US cents, said a company statement. On a like-for-like basis, revenue grew 6 per cent, adjusted EBITDA increased by 8 per cent with adjusted EBITDA margin of 53.2 per cent, and earnings attributable to owners of the company increased 15.1 per cent, it said. The company's revenue growth was supported by the strong volume growth across all three DP World regions. Like-for-like revenue increased by 6 per cent driven by a 6.9 per cent increase in total containerised revenue. Like-for-like containerised revenue per TEU (twenty-foot equivalent unit) grew 0.7 per cent and total revenue per TEU remained broadly flat (-0.2 per cent). Strong adjusted EBITDA growth resulted in a 7.3 per cent increase in profit attributable to owners of the company before separately disclosed items on a reported basis and 15.1 per cent growth on a like-for-like basis at constant currency, the company said. Cash from operating activities increased to $2.412 billion up from $2.002 billion in 2016, it said. Free cash flow (post cash tax maintenance capital expenditure and pre-dividends) amounted to $2.095 billion against $1.674 billion in 2016; leverage (net debt to adjusted EBITDA) decreased to 2.5 times from 2.8 times in 2016. The total dividend per share increased by 7.9 per cent to 41 US cents; ordinary dividend increased by 7.9 per cent to 41 US cents to reflect earnings growth in 2017, the company said. It said continued investment in high quality long-term assets is expected to drive long-term profitable growth. It made a capital expenditure of $1.090 billion across the portfolio during the year, below the group’s guidance of approximately $1.200 billion in 2017. In 2017, gross global capacity was at 88 million TEU and is expected to grow to over 100 million TEU of gross capacity by 2020, subject to market demand. Consolidated capacity was at 50 million TEU up from 42 million TEU in 2016 including the consolidation of Pusan (South Korea). "We expect capital expenditure in 2018 to be up to $1.4 billion with investment planned mainly into UAE, Posorja (Ecuador), Berbera (Somaliland), Pusan (South Korea), Maputo (Mozambique) and Sokhna (Egypt)," the statement said. DP World has partnered with the Government of India-sponsored National Investment and Infrastructure Fund (NIIF) to create an investment platform of up to $3 billion of equity to acquire assets and develop projects in the ports, transportation and logistics sector in India. 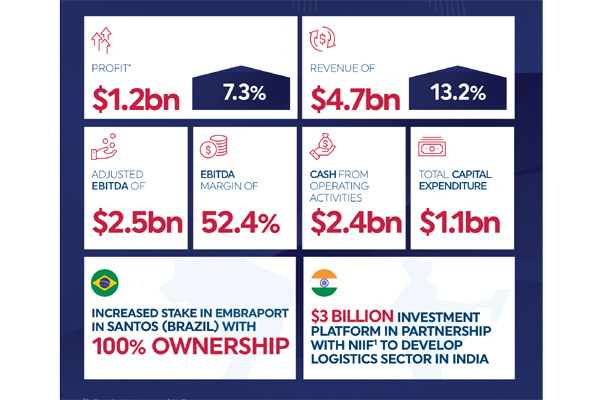 DP World acquired an additional 66.67 per cent stake in Embraport in the Port of Santos (Brazil) from Odebrecht Transport (OTP) to take its shareholding to 100 per cent. The terminal has an annual capacity of 1.2 million TEU and has been rebranded to DP World Santos. Looking ahead into 2018, the company expects to continue to grow ahead of the market and see increased contributions from its new developments, it stated. DP World group chairman and CEO Sultan Ahmed Bin Sulayem said: “We are pleased to announce another set of strong financial results in 2017, as we again delivered earnings in excess of $1 billion and above 50 per cent EBITDA margin for the full year. “On a like-for-like basis, our earnings grew at 15.1 per cent ahead of revenue growth of 6.0 per cent and EBITDA growth of 8.0 per cent. Encouragingly, our volumes have continued to grow ahead of the market with gross volumes growing 10.1 per cent year-on-year, ahead of Drewry Maritime’s full year market estimate8 of 6.0 per cent,” he said. “Our portfolio has seen strong performance across all three regions benefitting from the improved trading environment and market share gains,” he added. “Going forward, we expect this trend to continue as we seek opportunities in complementary sectors in the global supply chain and also make use of new technology and data solutions to provide better service to our customers,” he commented. “In 2017, we invested $1,090 million of capital expenditure across our portfolio in markets with strong demand and supply dynamics, and we will maintain capital expenditure discipline by bringing capacity in line with demand,” he said. “The company board recommends increasing the dividend by 7.9 per cent to $340.3 million at 41.0 US cents per share. The board is confident of the company’s ability to continue to generate cash and support our future growth whilst maintaining a consistent dividend payout,” he added. “Our significant cash generation and investment partnerships, leave us with a strong balance sheet and flexibility to capitalise on the significant growth opportunities in the industry and deliver enhanced shareholder value over the long term,” he said.